Yarmouth is a Cape Cod town three villages, each with its own character, some fine historic houses, natural beauty, and lots of beaches. In the north along MA Route 6A (map) toward Cape Cod Bay, Yarmouth Port is a village of dignified old houses, a New England country store, and several beautiful inns, all shaded by lofty trees. 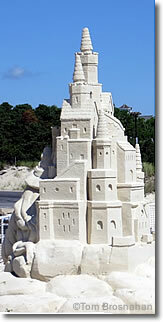 Splendid sand castle on Bass River Beach. In between, along MA Route 28 in the villages of West Yarmouth and South Yarmouth, are hotels and motels in a long commercial strip—the largest concentration of motel rooms on Cape Cod. The rest of Yarmouth is forested and dotted with freshwater ponds, some of which have good recreation areas with freshwater beaches. Yarmouth, being central on Cape Cod, and having lots of lodging choices in all price ranges, makes an excellent base for your time on Cape Cod. 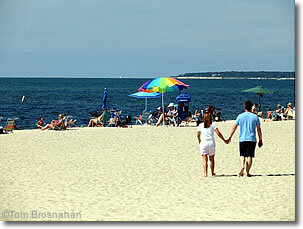 Despite its modern attractions and facilities, Yarmouth is not a new town. When European settlers arrived here in the 1630s, it was already home to the Hokanum, Pawkunnawkut and Cummaquid peoples, who called it Mattacheese. Originally part of Plymouth Colony, Yarmouth was incorporated as a town in its own right in 1793, and named after Great Yarmouth in Norfolk County, England. Here's what to see & do in Yarmouth. in South Yarmouth on Cape Cod.